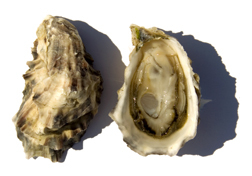 This oyster has a firm, plump meat with a briny and sweet aftertaste. They vary in size depending on the time of year. Raised in Discovery Bay, Washington.